For the ancient region, see Eordaea. 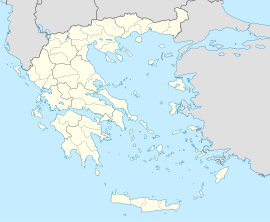 Eordaia (Greek: Εορδαία) is a municipality in the Kozani regional unit, Greece. The seat of the municipality is the town Ptolemaida. The municipality has an area of 708.807 km2. The population was 45,592 in 2011. The province of Eordaia (Greek: Επαρχία Εορδαίας) was one of the provinces of the Kozani Prefecture. Its territory corresponded with that of the current municipality Eordaia, and a few villages of the municipality Kozani. It was abolished in 2006. The history of Eordaia can be found stretching long before 2000 BCE when the first Greeks known as the Mycenean Greeks began to inhabit this area. Remnants of copper mines exploited from 2700 up until 1200 BCE indicate strongly that the Greeks inhabited Eordaia for many of years. Iron mines have also been exploited in the region. Within a 50-year period, paleontologists and archaeologists have made many discoveries due to the industrial development of the Eordaian countryside. In particular, the skeletal fossils of a prehistoric mammoth, a prehistoric elephant, and Stone Age tools have all been found within the province of Eordaia. These finds add to knowledge on the variety of animal species and human artifacts in this particular region of western Macedonia.